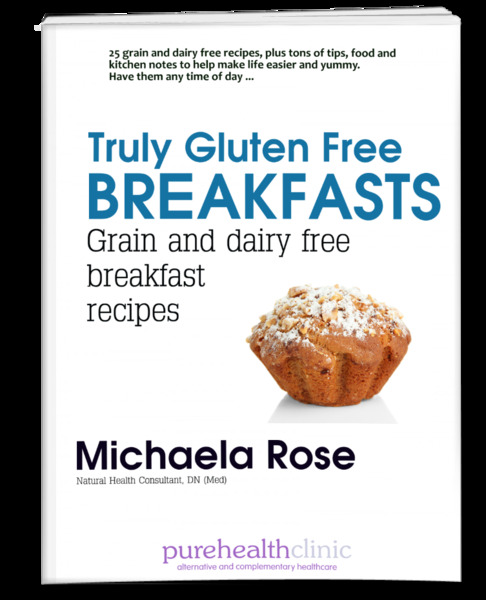 This 28 page ebook gives you 25 different grain and dairy free breakfast options, plus tons of tips, food and kitchen notes to make life as simple, quick and convenient as possible. If you haven’t a clue what to eat for a TGF-safe breakfast or need some new ideas and inspiration, this is for you. You can choose from cereal-replacements like Honey Nut Granola, go for new ideas like Breakfast Custard, grab a slice or two of Muesli Bread or Tortilla, eat a Muffin on the go or choose savoury options like Potato and Mushroom Medley and 100% Meat Sausage. With 25 recipes, tons of extra tips, food notes, shopping advice and instructions how to make your own yogurt, bread, muffins, pancakes, nut cream and more, you should find plenty of simple, tasty meals to start your day off well. I’m not a trained cook so you won’t find specific quantities and instructions all the time. I’m more of a ‘throw it in and see how it comes out’ kinda gal. But I am just like you; I need good value, quick and, above all, safe meals I can fit around my daily life that keep me well-fed, nourished and with loads of energy. I have adapted recipe ideas from various books and magazine articles, patients have sent some in and I have invented others through trial and error in the kitchen. Often when dealing with TGF ingredients, you may need to have a bit of trial and error yourself as oven temperatures, ingredients to suit your further allergy needs etc vary, but the basic recipes are here for you to play with. Have fun. Who says a grain and dairy free diet can’t taste yummy?